It also has a fitness room: you know, where the weights and treadmills and stuff are found. I was getting an informal tour of the campus when we first arrived back in September, and I thought Great! This means I don’t have to pay for a membership to a private gym. I didn’t know about The Class, though. Or the online booking. Those turnstiles are not to be approached lightly. The gym here—and maybe at other unis in HK too, I don’t know—uses this kind of brilliant booking system to ensure that no room ever gets overcrowded, or that there’s a huge line to use the ping pong tables. You just go to a website, log in, and select an activity and a one-hour time slot. If there are none available, you’re out of luck. To keep people from skipping out on scheduled sessions, you have to pay each time you go. (If you miss it, you have to pay for it next time, like an overdue library book.) 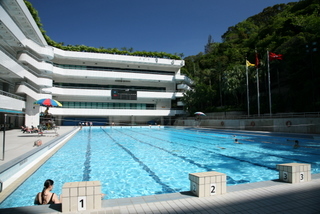 It’s a token amount for students, like HK$3 (US$0.40) to play badminton for an hour, and about twice that for staff and faculty. It’s cheap, no matter what. You show up at your appointed time, pay your fee, and go to wherever you’ve reserved a place. This is definitely unlike any other gym I’ve been to before, but it’s fine. Heck, there is something kind of compelling about knowing that you have to go to the gym at a certain time. No procrastinating. So I go to the website to reserve an hour at the fitness room, and I get a weird error message: I am not authorized to make this booking. Eh? Upon further investigation, it turns out that one must attend a special two-hour class in order to be authorized. There is a class in Cantonese every week. There is a class in English once a month. I just missed the September class. So I dutifully sign Cate and me up for the October English-language fitness-room-authorization class. (This involves a full page form that must be faxed to the Physical Education office at least one week but no more than one month before the intended class….) And we wait. In retrospect, we should have just attended the next available Cantonese class and nodded and smiled our way through. Most of this was, frankly, really dull, though I stayed alert because it was no more than 65° in there and we were required to appear in workout gear (i.e., shorts and t-shirts). The highlights, however, were the two experiments that our instructor ran. Experiment #1: Is the ab crunch machine any good? Materials: one Cybex ab crunch machine; one unwitting student; one 25-lb. dumbbell. Method: Have student do crunches on Cybex machine at maximim possible weight. Note weight. Then have student lie down on floor to do traditional crunches, holding on his chest a dumbbell equal in weight to the maximum Cybex weight. Ask student: can you do as many crunches this way? Note that answer is negative. Observe that on the Cybex machine, therefore, he must have been using his arms to push down rather than fully engaging his abs. Discussion: That kid looks like he’s about to die. Conclusion: The ab crunch machine is no good, and should be avoided. Experiment #2: What is this man’s one-rep max? Materials: one Cybex chest-press machine; one unwitting gentleman. Method: Ensure that gentleman has not warmed up and appears to have no experience with using weight machines. 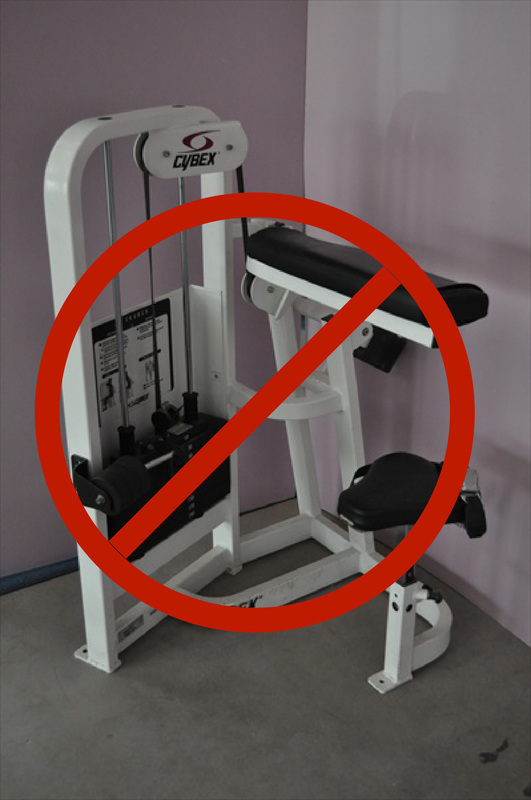 Have gentleman sit on Cybex chest-press machine and perform one rep at low weight. After each successful rep, increase weight by 20 lbs. and repeat. When gentleman’s arms are shaking, back is arched, and involuntary groans are coming from mouth, stop. Announce final weight. Pause to allow unsolicited applause from assembled audience to die down. (No joking.) Note that this weight is gentleman’s “one-rep max” and that generally it is not safe to train at that level unless you are an elite athlete. Direct gentleman to water fountain for refreshment. Discussion: That gentleman looks like he’s about to die. Conclusion: That man’s one-rep max is 95 lbs. The upside is that we avoided becoming experimental subjects ourselves and are now certified. It took only a week (!) to get the actual card that we need to put, along with our “booking slip,” into a cubby on the wall of the fitness room to prove that we are both authorized to be there and have paid up for our hour of fitness. There will be unannounced spot checks of such documentation, everyone, and you do not want to get on the bad side of the PE, Sports, and Wellness Office.